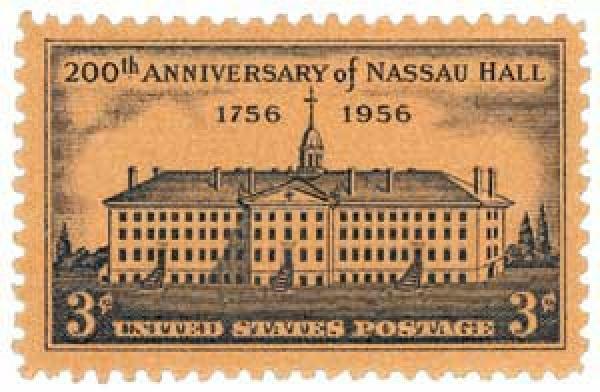 U.S. #1083 was issued to celebrate the 200th anniversary of Princeton University’s Nassau Hall. At the time it was built in 1756, Nassau Hall was the largest building in New Jersey. Nassau Hall is the oldest building on the campus of Princeton University, which was founded in 1746. The hall was completed in 1756. During the American Revolutionary War, the building was occupied by both British and Colonial forces. General George Washington captured Nassau Hall, bringing the battle of Princeton to a successful conclusion for the Colonial Army. This victory marked a major turning point in the Revolutionary War. Today, the hall contains the administrative offices of Princeton University.